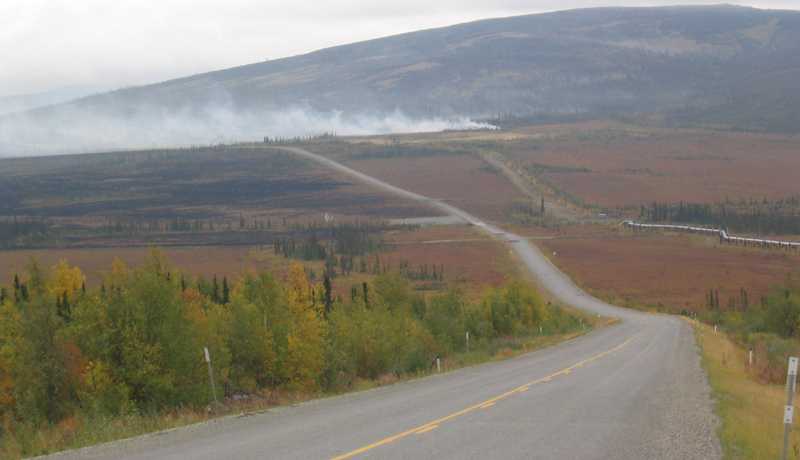 This is a revised and updated version of the original Dalton Highway Photo Journey, which was co-authored and hosted by Andy Field. 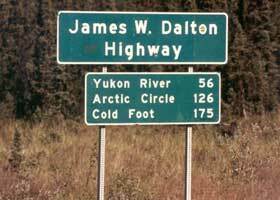 It was an adjunct to the Dalton Highway page of his former site on High Priority Corridors (a few dozen highways deemed by Congress to be of special national importance and worthy of priority Federal support -- the Dalton Highway is High Priority Corridor 24). 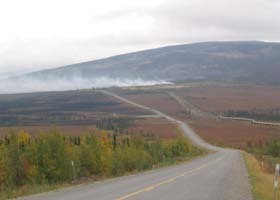 The largely unpaved 415-mile-long Dalton Highway runs from Livengood (on Alaska state route 2 northwest of Fairbanks, about halfway to Manley Hot Springs), through the Brooks Range, to Deadhorse and Prudhoe Bay. Its gravel surfaces are notoriously rough on tires and windshields. Built in haste in 1974 as the "haul road" for construction of the parallel Trans-Alaska Pipeline, it remains a vital supply line to the oilfields of Alaska's Arctic Coast. Long restricted to oilfield and pipeline service vehicles, it is now open to the general public all the way to its north end a few miles south of the Arctic Ocean. 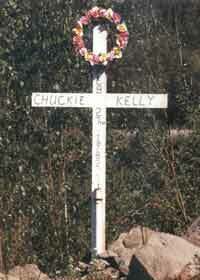 However, there is almost no population along the way, and travel services are very limited. 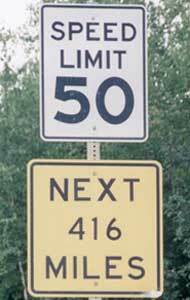 North of Coldfoot is the longest service-free stretch of highway in North America -- no gas, almost no food or lodging, no nothing (except awesome scenery) for 240 miles. 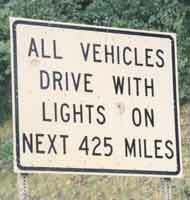 Unless otherwise indicated, the photos below are my own, and from a van tour of the highway I took in suumer 1994. 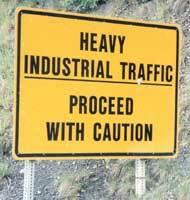 A few photos were taken on my return trip to Alaska in summer 2001 which included just the first few miles of the highway's southern end. More of my photos were taken on my July 2012 round-trip drive of the highway in my pickup truck. I've also added some photos from Bob Hoffmann's Alaska Adventures collection (once online, but apparently no longer), the U.S. Bureau of Land Management, and many by Walter Haight from his August 2004 trip on the highway to the Arctic Ocean and back, to fill gaps in my collection. If you have photos I can use, with appropriate credit, to fill other gaps, please e-mail me. NOTES: If you want to see a more detailed version of one of the photos below, click it to view an enlarged, and sometimes higher-quality (less .jpg compression), version if one is available. Those alternate versions have much larger file sizes, so please be patient while they download. This photo collection is divided into three pages. 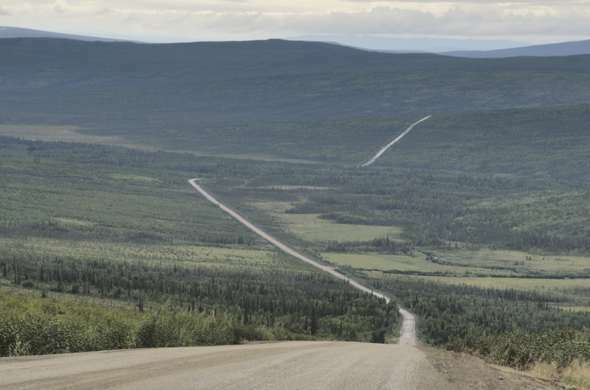 The photos below cover the southern end of the highway, from its beginning in Livengood to the Arctic Circle (mile 115). Page 2 covers the middle segment from the Arctic Circle to Atigun Pass over the Brooks Range (mile 245). 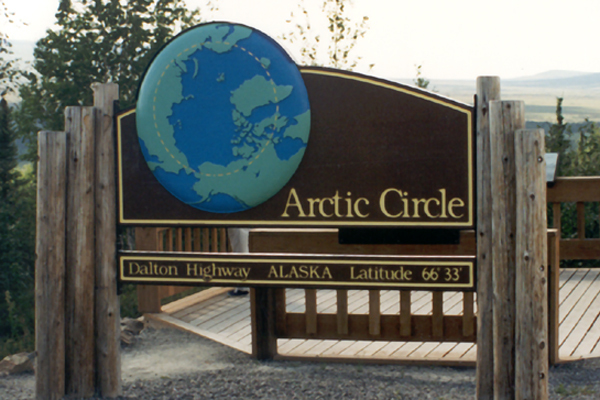 Page 3 completes the journey north to the Arctic Ocean, and concludes with a list of reference sources and some other Dalton Highway-related web sites. 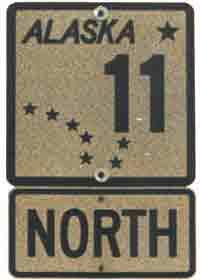 This route marker was at the southern end of the Dalton Highway. 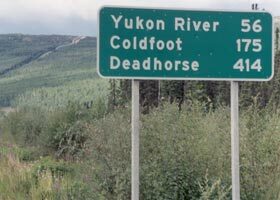 Others can be found near the Yukon River crossing (mile 56), Coldfoot (mile 175), Slope Mountain Camp (mile 305), and maybe the highway's north end in Deadhorse. 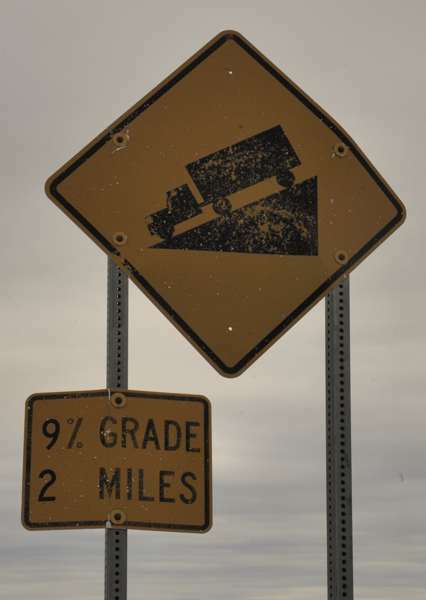 The Dalton Highway was long the highest-numbered route in Alaska, until 2001 when the Klondike Highway from Skagway in southeast Alaska to the Canadian border was designated as route 98 (for the gold rush of 1898). 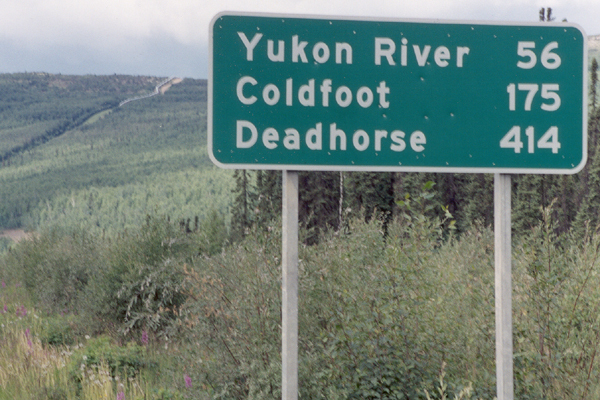 The distance sign on the left at the beginning of the Dalton Highway is from my July 1994 vacation. 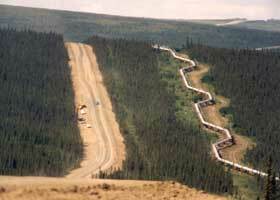 (The highway is named for an engineer involved in early oil exploration efforts on the North Slope.) 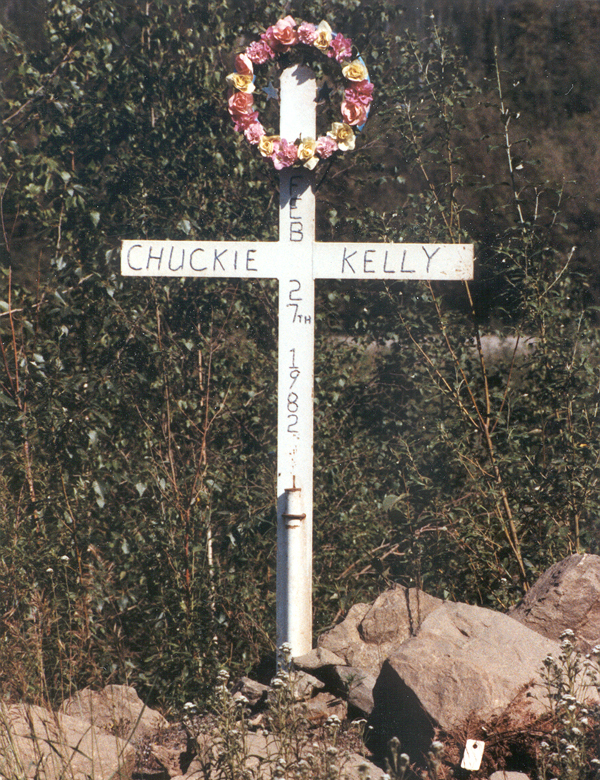 By my return in June 2001, it was replaced by the sign on the right (with the Trans-Alaska Pipeline, paralleling the highway, in the background). 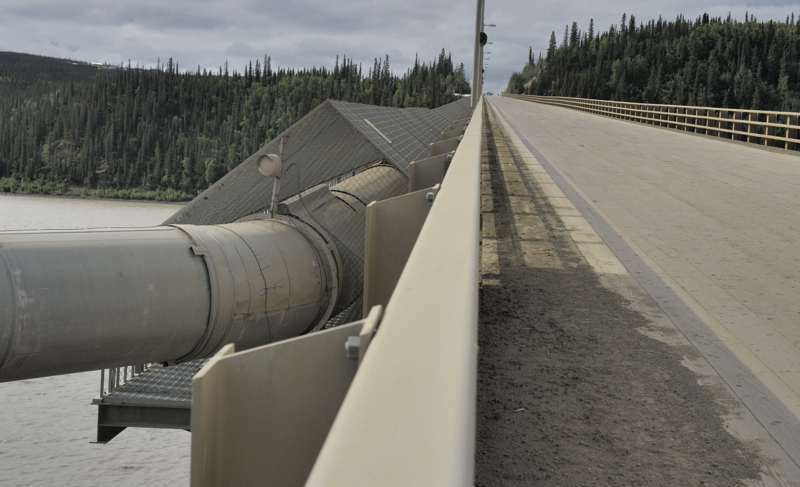 Alaska Roads main page (under construction as of May 2018, but has some useful information and links). © Oscar Voss 1994, 2001-2002, 2004-2007. 2012, 2018.